There’s a big UCI gathering in Montreux, Switzerland at the moment and the seminars are reviewing the state of pro cycling, yesterday was for women’s cycling, today it’s the men’s side. There’s little news so far, official or leaked but one item is the extension of the video commissaire to all World Tour races according to Belgian newspaper Het Nieuwsblad who’ve spoken to Philippe Marien, a UCI commissaire who officiates at a lot of big races. Friday update:: it’ll be extended, but not to all races. This should be a good thing but it won’t be cheap, taking the UCI’s video truck to different races, staffing an extra official and more and it’s unclear who is paying. Marien also reminds people that the UCI have updated a lot of their fines, something this blog has long called for, for example littering used to cost 100 Swiss Francs, now it’s 500 for World Tour races and similar, proportional rates for other cases, a sticky bottle is no longer 50 Francs, it’s 200. Enough of a deterrent? More than before and we’ll see, especially with more video evidence. Will it pay for the truck? Probably not because before anyone rushes to the comments with “this is a UCI moneygrab” remember that fines don’t go to the UCI but the local federation instead. Before the Montreux meeting, the race organisers met late last month in Amsterdam at their annual meeting and were briefed by UCI President David Lappartient. 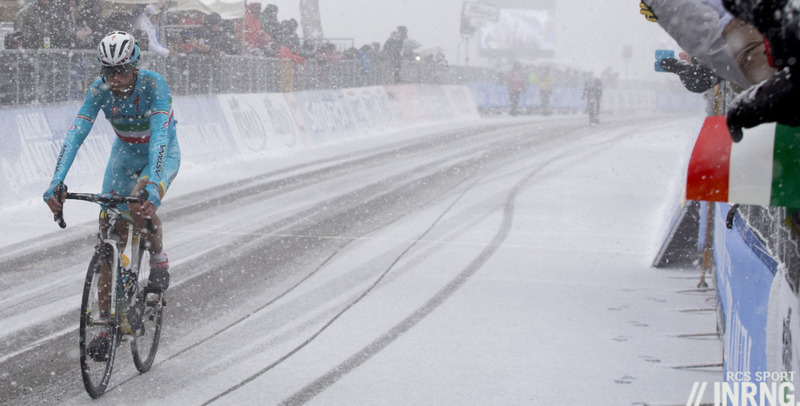 One thing is to reshape the calendar to reduce overlaps and calendar clashes, for example the Giro and the Tour of California has been in the news recently with both owners keep to find dates that don’t clash… what happens if there’s a clash of races and the UCI only has one video commissaire’s truck? More details have been put online by the GP de Denain, spotted by French website velochrono. Here the HC-status events, those just outside the World Tour, like Kuurne-Brussels-Kuurne, the Tour de Yorkshire, the Tour of Oman (pictured) and the Tour de Qinghai Lake will be reviewed in the future and among the criteria there’s TV national and international coverage. Not easy for some races, some come as part of a package eg Paris-Tour is part of ASO’s bouquet, Milano-Torino part of RCS’s portfolio but others are alone and may have to pay for the TV coverage (like many races do, only a handful make money from TV rights income). Staying in Switzerland and there’s a bid to host a stage of the Tour de France. So far, so normal as many places in France and beyond lodge requests and the host towns cornered race boss Christian Prudhomme ahead of his visit to Montreux. The difference here is they’ve also submitted a proposed route and made a press release out of it. 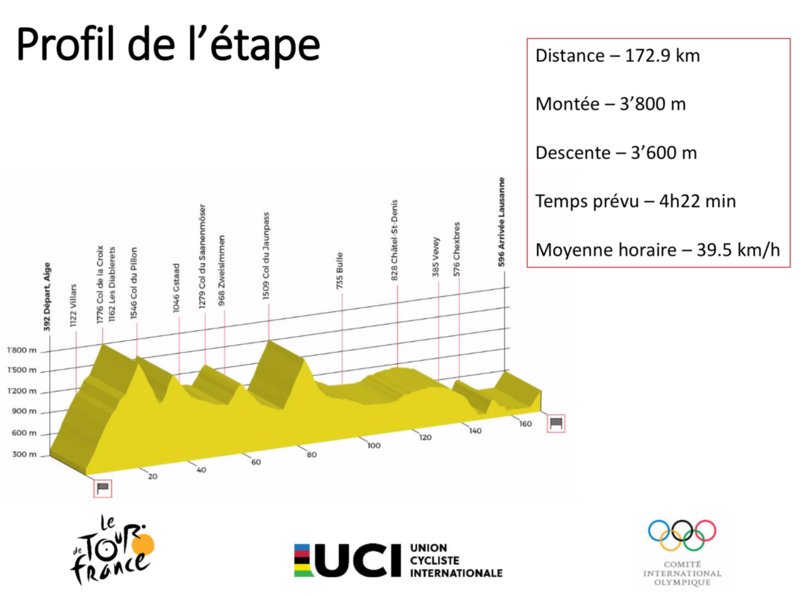 The plan is to go from the UCI’s HQ in Aigle to Lausanne, home of the International Olympic Committee, via several Alpine passes although surely the route in reverse would be more exciting? 2020 and 2024 seem obvious dates. From Switzerland to Britain: one country outside the EU and another heading out. Several readers have emailed asking if Brexit, the UK’s departure from the EU, will change anything. It’s hard to answer as the British still haven’t worked out what form their Brexit will take but there’s probably not going to be much change; we’ll see if British riders need permits to live in Monaco or Girona but that’s probably far fetched. More certainly and the Pound has fallen but this won’t worry Sky, a clause in their contract allows them to draw down money in Euros. For women’s cycling the Prudential RideLondon Classique, the women’s circuit race held in London every August and billed as the “richest women’s one-day race in professional cycling” because of the big prize pot won’t impact the winners as they pay out in Euros. The European Cycling Union (UEC) – their photo – is the umbrella organisation for European Federations and does have the Council of Europe’s flag of yellow stars on a blue background as its logo and this features on the jersey worn by the winner of the annual championships. But the UEC is very different from the EU, members go from Albania to Ukraine via Belarus and Russia… and Switzerland including current U23 champion Marc Hirschi so the UK will part of this European confederation. Now to travelling across Europe and the Transcontinental Race has revealed details for 2019 with a start in Burgas in Bulgaria on the edge of the Black Sea to Brest on France’s western tip. There’s no route as it’s up to participants to chose their way but checkpoints include the Passo Gardena and Alpe d’Huez. It’ll be mountainous but the hardest part could be the final days across the plains to France’s westernmost point, a much less spectacular landscape. Live in the northern hemisphere? Find winter riding harder? It’s scientific as cold air is more dense, requiring more watts to hold a given speed compared to a summer’s day. A drop of 20°C can cost you 1km/h just from the change in air density alone and that’s before you don extra layers which affect aerodynamics further. You can play around with temperature to get air density here and then work out your speed here. Finally RIP Paul Sherwen who died at home in Uganda last Saturday, a voice of the Tour but so much more, think rhinos or Raphaël Géminiani. His funeral is tomorrow. Why can’t the UCI simply put this official in the TV director’s truck? Isn’t that where all the screens showing all the video feeds are viewable by the TV director who then chooses what is broadcast to us punters? When there’s an infractionm crash or some other interesting action, it’s pretty rare for the broadcaster not to have it recorded so it can be shown to the audience to illustrate whatever has happened. UCI having their own expensive setup for this video commissaire seems like reinventing the wheel, unless there’s something I’m missing. Do they plan to have their own helicopters, motos, etc. recording the race action as well? There’s not much room in there and the commissiare needs their own place to zoom, review etc rather than look over the shoulder. For now they have a truck but maybe they could do it on a tablet with tech. Surely this should be a given, you could offer a load of different style feeds including a Commissar feed and charge viewers extra for it? It becomes a really exciting prospect with camera’s on bikes and rider telemetry. It exists already, French viewers in the Tour de France can watch the race online but also view the other moto/helicopter shots, Eurosport Player offers this too during July. It sounds great but try it and you quickly appreciate a good director who cuts to where the action is rather than six screens of little happening. Relax mate, it’s just an off-the-shelf broadcast truck taking the feeds from the host broadcaster and recording them for review. Hard to see a more efficient alternative really. I’d prefer not to have broadcasts interrupted by the UCI demanding the TV director cut away from live acton to review some petty penalty. The UCI have purchased a full recording/edit suite that fits into a mini-bus but can also be lifted out and used at track races etc. If races overlap (or it can’t be transported out of Europe easily) hiring in a similar set up is possible. It is basically just a couple of very powerful PCs with some specialist software and the appropriate converters/switches to take whatever feeds the host broadcaster is able to provide. I see live broadcasts are being trialled in the UK using 5G infrastructure for sports events in stadia and there is already use of IP broadcast for football. Assuming that sort of thing becomes more widespread the need for video converters etc goes away and then the required kit is not much more than a couple of powerful laptops and big monitors. A bit of Besserwisserism: since the Council of Europe (which includes just about everybody but the Vatican and Belarus and which the UK is not going to leave) and the European Union share the same flag, there’s no way of telling which of the two flags the stars come from – unless the UCI has expressly stated that they derive from one or the other. So let’s just say they are (three of the twelve stars of the European flag. Winter cycling is – if you happen to live in the northern parts of the northern hemisphere – harder mainly because you cannot ride without spike tires. (Or you can, if you are young and/or foolish and fearless, Or if you only ride on snow, i.e. when there’s no ice.) The good thing is that when you’re doing 20 km/h instead of 30 km/h – and I’m exaggerating only a little – it means the wind chill is not quite as bad. Another factor is that you don’t really expose your better bike (even if it should have clearance for studded tires, a minimum of 35 mm) to the nasty side of winter cycling: road salt, gravel, slush aand water, freezing and thawing etc and you usually ride a heavier winter bike with fenders. Given the membership of the UEC is closer to that of the Council of Europe than that of the European Union and that it was established back when the EU was still the EEC, I think we can definitively say that it refers to the Council of Europe rather than the EU. You are of course right and I made too much of the fact that the two flags are indeed not only similar but the same. Besides, there are are members of the UEC that never were members of the EU. I agree on the difficulties of catering for ice – my experience of winter in the Alpine parts of Europe is that it just didn’t stay cold enough and therefore a lot of freeze/thaw cycles resulted, causing much ice. This is difficult for bicycle tyres and also simply for walking on paved surfaces, especially steep ones. Conversely in (parts of) Canada it tends to stay below zero for months on end and this makes life much easier – ice tends to happen only for short periods in spring and autumn. However, in recent years ever more use of salt on roads has somewhat increased the occurrence of winter ice. There are times when I really thought the only safe method would be a three- or four-wheeled bicycle, of which there are several homemade contraptions year-round. A further complication of thawing on the roads is for those who do not have space to bring a bicycle into a heated area overnight – after riding and getting the road-slush spray on the cables, the gears and brakes would inevitably be seized up the next day. Never had a winter bike. Always felt life is too short to go for a lesser bike when the good one is available. I think people who do this go outside for training, not necessarily for having fun. For me it always needs to be fun. Otherwise Zwift can provide that and I don’t spend extra time having to put on all the layers, then clean the bike after the ride. Sad to hear of Paul Shewens passing. He and Phil.L will always be the voices of cycling for me. A reliable constant into the small hours of winter nights back in Aus during Tour time. RIP. Regarding cold air and heat, it is relatively common for Hour Record attempts at indoor velodromes to have the heating turned on to ensure optimum conditions. This was the case when Dr Bridie O’Donnell set the women’s record, the heating was used even though it was done in January at Adelaide! That’s true. Wiggins had the heat cranked up as high as it would go for his hour record attempt. People questioned why he didn’t try and do it at a higher altitude too (for the same air density/atmospheric pressure reasons). In F1 when they race in mexico city (~2000m above sea level) they hit some of their highest top speeds of the season. Regarding riding in winter – in London it’s just wet and dark, it doesn’t seem to be that much colder. I’ve lived here for 5 years and it’s gone below zero on one occasion. no spikes for my bike! the main challenge is to make yourself seen in the dark, so lots of reflective fluorescent garb is required. Heating the velodrome is about avoiding bronchoconstriction due to inhaling large volumes of cold air, not aerodynamics. Wiggins has never been a good performer at altitude, so he was better off staying at low level where the poorer aerodynamic performance was more than offset by the increased power available from having more air to breathe. It’s not equal for all cyclists. The UCI recognises World Records in three track endurance events (individual pursuit, team pursuit, hour record) with only two of the six current records (men’s/absolute individual pursuit, women’s hour record) having been set at high altitude. Thank you for the winter update. Have been feeling the weather change more this year than ever for some reason. I find winter riding harder. Not because of the denser, colder air though. Its the getting dressed, putting about 5 layers on, putting overshoes on and then having to take it all off later when you’re freezing and your hands don’t work that annoys me! Nothing worse than having to change an inner tube by side of the road in winter!! Agreed the whole getting dressed in a million layers thing is such a pfaff I push my rides until 11 am as a combination of the sun coming out and heating things up and not wanting to screw around getting dressed at 7am. Darkness is way better than endless grey skies! A decent lamp – and I don’t mean those megalux lights that are brighter than car lights – and you can fins a nice flow in your riding. Besides, 25 km/h in the drak feels like 30 km/h in daylight. If your hands are freezing, put a warmer hat on! That is the golden rule and for a cylist that means a balaclava, a windproof under helmet cap and closing the air vents of your helmet with duct tape. And buying a bigger helmet for winter use, if necessary. I would also warmly recommend alpine skiing gloves. PS Winter riding *is* fun – or at least a certain percentage that is no smaller than during other seasons. Similar to an old mountain saying in Kentucky – “If your feet are cold, put on a hat.” Sadly, it doesn’t work. You do lose a lot of body heat from your head if it’s uncovered, but the head covering only helps maintain core temperature. When I ride now (Netherlands, cold and wet now but not yet near freezing), my ear-warmer head band (and poorly ventilated helmet) keep my head so warm that by the end of the ride I am tempted to take it off. I can’t, though, since my fingers are too numb to function, despite wearing insulated gloves. And my feet, despite thermal hiking socks, take about an hour after the ride to warm up again (yes, shoe covers would help). I do agree it’s still worth doing. Not necessarily fun, but the sense of satisfaction afterwards with a cup of hot coffee in those frozen hands is worth the minor suffering. Ah, first-world problems. The new fines levy looks, at first hand, to be quite severe. The littering fine, for example, now being almost £400. A rider wouldn’t want to get hit with several of those in succession, I’d have thought. Personally, I’d rather the UCI lowered the weight limit of the bikes but made littering verboten; a rider must carry their litter and only despatch bidons to the side of the road when fans can collect them? There are almost always fans at the side of the road: I always find it pretty inexcusable when riders don’t lob their bidons at one of them. It’s quite evident that the attitude is ‘I’m a pro, this is what pros do’ as they chuck it off a bridge into a beautiful ravine where it can’t be collected for the umpteenth time. There are already ‘litter zones’ where crap can legitimately be ditched without a fine. Are they even bringing that up in conversation? What on earth are they waiting for?